Anxiety condensed into fear as frost accumulated on the windows inside the truck cab. "Now it's 12 below," Steve announced and snapped a picture of the temperature gauge on the rear-view mirror. The nearly full moon hugged the horizon, casting an ominous violet glow over a forest of birch and black spruce trees, all freshly coated in snow. We pulled into the Point MacKenzie General Store parking lot and emerged in the biting air. The frozen morning suddenly came alive, with the purple reflection of the moon retreating from the deep crimson light of the sun. I grinned in spite of myself. "Hello Alaska," I whispered. We struggled to keep fingers and toes pliable as we packed our sleds, checked in, and ducked into the store for breakfast. Beat and Danni quietly picked at their pancakes and Steve looked sick with nervousness. I felt more in my element with the prospect of the snowy trails and cold, but I envied their running experience. Each one of them knew they could travel 100 miles on foot in one shot. I really had no idea. Over the past few days, I visited with many of my friends in the Anchorage area, and always got the same question — "Why are you running it this time?" My simple answer was to see if I could. In my mind, the Susitna 100 itself wasn't the journey I sought. I was looking for a more internal experience, amid a daunting and unfamiliar physical challenge, with the knowledge that unlike many of my more epic adventures, I would be sharing this experience with somebody else, somebody I was in love with. What would the dynamics of that be like? For me, all of those aspects were more intriguing than the simple act of traveling to Alexander Lake and back. And for that reason, even when I was at my lowest moments of the race, I never found myself wishing that I was on a bicycle instead. Thanks to last-minute gear adjustments and my desire to photograph the bike-ski-run procession, Beat and I missed the start of the race. Despite starting a few minutes late, we quickly caught up to the Conga line of cyclists pushing along the soft trail beside Ayrshire Road. Several of the cyclists seemed panicked, but I knew that this roadside trail didn't represent the condition of the snowmachine highways that dominate this course. It was a clear day, and traffic would smooth out the trail soon if it hadn't already. The condition of the snow itself was disconcerting, however. Fresh snowfall followed by extreme cold covered the trail in very dry, unconsolidated grains of fine snow that is often called "sand," because that's what it resembles. Sand can be packed well enough for bikes and snowmachines, but feet still tend to punch through the crusty surface to the soft fluff below. It's like running on the beach — very taxing physically, and the uneven surfaces wreak havoc on feet muscles and tendons before working their way up the legs. On top of that, sandy snow is too rough and cold to offer any sort of glide for skis or sleds. Our 30-pound sleds tugged behind us like stubborn dogs. 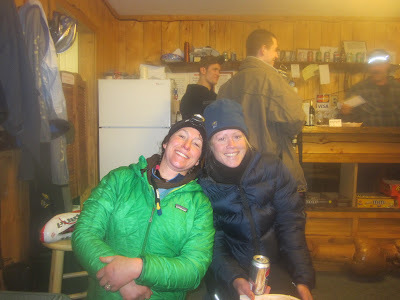 Despite the already difficult conditions, we were all smiles in the first miles of the Susitna 100. The day dawned bluebird bright and gorgeous, and we ran strong and warm in the sunlight even though frost buildup on our faces indicated the temperature was still below zero. The trail dipped into and climbed out of drainages and crossed frozen swamps surrounded by spindly black spruce. 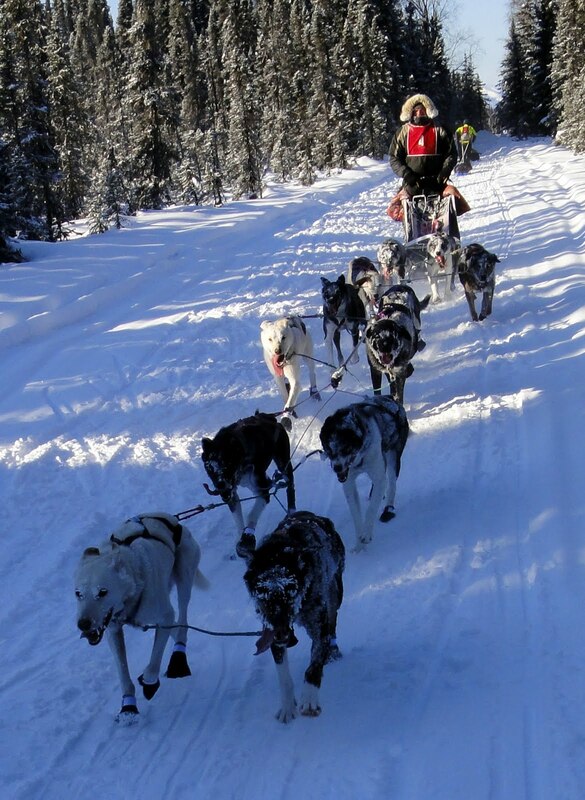 The condition of the snow and drag of the sled made jogging along at 4 or 4.5 mph as physically taxing as climbing steep hills or trying to knock out 8-minute miles had been back home. I certainly couldn't afford the effort for 100 miles, but knew we had to hustle in the first 22 miles of the race to make the Flathorn Lake cutoff. Beat and I often ran side-by-side and made animated gestures as we chatted and I gushed about how much fun we were having. He looked relieved that the subzero cold wasn't as big of an issue as he feared, and seemed genuinely impressed by the stark subarctic scenery of the Sustina Valley despite its lack of dramatic mountains. 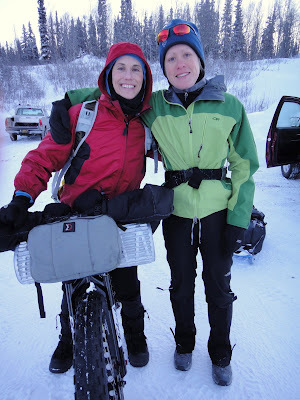 We watched sled dog teams speed past, waved happily at snowmobilers and leap-frogged frequently with Danni, who also had a permagrin on her face. "This is just ... amazing," Danni said as we dropped onto the open ice of Fish Creek Slough and jogged toward the dramatic view of Mount Susitna. "Isn't it, though?" I beamed with pride. My friends like Alaska, too. We were in an out of Flathorn Lake Lodge fairly quickly — just enough time to refill our water bladders and eat a bowl of Peggy's famous jambalaya. Danni, Beat and I headed out together across the lake, still talking and laughing. I pointed out the slough where I broke through the lake ice and got frostbite on my foot in 2009. "I was in a much worse place the last time I was here," I said. "It's so weird to be back here." The sun drifted low on the horizon as we traversed Dismal Swamp, finally fading into a golden blur behind Mount Susitna. 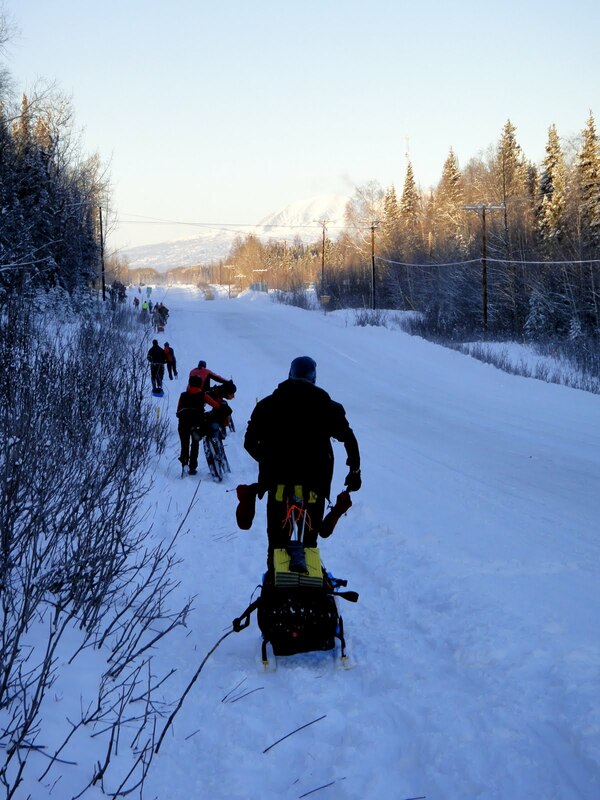 We encountered the leaders of the bike race at Susitna River on the "Wall of Death," so called because it's generally hazardously icy. Three cyclists rode side by side down the river trail and pushed up the Wall, smiling and congratulating Beat and I as they passed even though we were merely at mile 28 and they were an astonishing 22 miles from the finish. A good year for bikes indeed. "There's going to be a headwind on the Yentna River," Jeff Oatley said to me in his characteristically nonchalant way. Last year in the White Mountains 100, it was Jeff who warned me that Beaver Creek would be significantly colder than the rest of the course. I didn't do anything to heed his warning last year and became seriously chilled on Beaver Creek. Why, oh why don't I listen to the things Jeff Oatley tells me? But we had left Flathorn Lake in the "heat" of the day, and I was still feeling quite strong. On the open Susitna River, the wind picked up and the chill started to drive into my insulation layers. I knew I wasn't wearing enough clothing, but at this point we were far from any kind of wind protection, and stopping out in the open, in the wind, is quite daunting. I thought if I picked up my pace, I would stay warm. But, as I learned last year in the White Mountains, a chilled body is not all that effective at warming itself. I became colder and colder. We traveled up a slough and turned onto the Yentna River. The full brunt of a very strong wind hit us directly in the face. I no longer had a choice. "Beat, I need to stop and put on my down coat," I said. He nodded and opened his own sled to dig out extra layers as I rifled around for my coat, a heavy balaclava, my face mask and mitten shells. I removed my liner mittens, pulled on my head gear and unzipped my Gore-tex shell so I could put the smaller down coat underneath. I require dexterity to manage zippers and have many times before worked with bare fingers in extreme cold. But I'm used to having a bicycle with heat-pack-warmed pogies that I could quickly retreat into when my fingers lost strength. And this time, I was already starting with cold hands and a chilled core. My fingers froze almost instantly. The speed and potency at which my hands became completely useless took my breath away. Panic gurgled up from my gut. The fierce wind tore all around me. There was no way to get to tree cover without wading through deep, unbroken snow. I brushed my rigid hands futilely against my zipper and knew that battle was lost. I gathered up my down coat and stuffed my hands inside the pockets, holding the mass close to my chest. "Don't panic," I whispered to myself, which is always the first thing I think of when my breaths start to become short and fear washes over me like a black tsunami. I thought of my bivy bundle. I could pop that open and crawl inside on the open river, then hold my hands between my legs until they warmed up. Amid this rampant swirl of thoughts, I remembered Beat was still there. I turned back to him. "I froze my fingers. I can't zip up my coat. I really can't." The squeak in my voice startled me. "Ok," he said. "Just give me a second. He zipped up his own coat and pulled on his liner gloves. It occurred to me that despite his lack of cold weather experience, he was doing the smart thing by taking care of himself first so we didn't both end up in crisis. A warm sensation of love and gratitude washed over me, and the panic tears I had been fighting filled my eyes. Beat walked over to me, helped me pull off my Gortex shell and then pulled my down coat over my arms, zipped it up, and helped me put the shell back on. As he finished packing his sled, I used my hand stumps to wrestle my mittens back on. Already I could feel warmth building in my core. I jumped up and down and swung my arms until my hands began to burn and my painfully tingling fingers began to move upon prompting again. I breathed out. Crisis over. We still had about eight miles to travel up the river, long and slow-going into the brutal wind. I was constantly on the margin of being too cold but unwilling to stop again in the wind to put on more layers. Every time I saw a light against the river, I was certain it was Luce's. At one point, I decided it must be just around the corner and asked Beat how far he thought we were. He consulted his phone application and announced it was five more miles. "That's impossible," I said, until I consulted my own GPS. We trudged quietly into the inky night, beneath a sky washed in stars, but all I seemed to notice was the wind. Beat had to make another stop to grab his own down coat. I felt I couldn't afford any more stops, and selfishly asked him if he minded if I run ahead. "No, I'll catch you," he said, but he sounded unsure. I should have just waited a few minutes, but I was being selfish, and didn't want to lose the feeling in my hands again. "See you soon," I said. The lights of Luce's were a half mile away when Beat finally caught up to me. He was breathing heavily and had a white look of distress in his face, like he was about to pass out. "What's wrong?" I asked. "Are you OK?" "No," he said. "I am really sick. I almost threw up back there. I think I am deep in bonkville." Amid the dangerous cold and wind crisis, I hadn't eaten or drank a single thing since the Dismal Swamp, which was likely more than five hours before. Beat was probably also not eating or drinking in that time. I wrapped an arm around him and pointed to Luce's. "That's the checkpoint right there. We're really close." He nodded and trudged beside me. "I'm sorry I left," I said, trying to mitigate my guilt. "I was just so cold I didn't want to stop. I had no idea you were struggling." "You left me," Beat said in a somewhat playful tone, but he looked despondent, and I believed he was disappointed that I ran ahead. I'm learning this is an important aspect of partnership, both in outdoor adventure and in regular life — never assume, and never leave the other person behind. Luce's Lodge was crowded with runners and cyclists who were on the return ride down the river. The mood inside was jovial, with racers taking turns sitting in the lodge's sauna and downing giant plates of spaghetti and meatballs. Steve was still inside the checkpoint, repacking his gear and also looking borderline hyper — excited and anxious — about the epic conditions of the race. I ordered a plate for myself and a Diet Pepsi for Beat, and tried to coax him to eat something. I removed wet layers and sat down near the fire. As my body warmed up, I started shivering rather violently and spilled coffee on my pants twice before Beat took the cup away from me. A group of snowmobilers walked in and said they saw temperatures around 16 below on the river with 25 mph winds. One racer said it was closer to 19 below in spots. It was still early; there was a long, cold night in front of us. Beat's eyes were bloodshot and his face was ghostly white. He said he was experiencing a major bonk. And he would know, because he's been through more than his fair share of ultras. "I'll be able to get back out there. It's just going to be a while," he said. I knew I would need to dress significantly warmer to go back outside, but I was certain I had enough gear with me to fight the wind. Under the reported conditions, the windchill would have been somewhere in the range of 40 below. Definitely too cold for a single layer of windtights I was wearing when I left Flathorn Lake. No wonder I was chilled. At this point, we were only 41 miles into the race. Not even halfway; not even all that close to halfway. As I sat mulling this prospect, Danni bounded in looking cheerful. "How was the river?" I asked her. "Did you get cold?" "Not too cold," she said. "But that wind was going to be a deal-breaker for me. I decided I was going to quit if it kept up, but I think the wind is dying down now." "Hopefully," I said. "Beat and I are going to spend a little more time here. He needs to eat something and I wouldn't mind drying out some stuff." Other racers sat down next to us to chat. The bikers told us the Alexander Lake trail was bad — soft and slow — and the crosswind was brutal. Several were bedding down to take naps. One 60-something-year-old runner came in wearing jeans and talking up a storm about the HURT 100, as though Hawaii somehow had relevance to the task at hand. I was ready to return with Beat to the solitude of the trail, but knew we were both going to have to get healthy first if we stood a chance outside. I munched on my spaghetti and contemplated 60 more miles of this. Fantastic report, more thrilling than any detective story! Thank you for writing it! Karen, I agree. It would have been a very different, much more scary situation if I had been alone. I feel confident that I could have gotten through it, but it may have taken much more drastic measures, such as bivying for a short time until I could warm up my extremities. That was an eye-opener. It was my first winter ultra where I wasn't alone, and it made a big difference. "Under the reported conditions, the windchill would have been somewhere in the range of 40 below." Your posts are awesome. I look forward to reading them. One thing, they usually make me shiver while sitting in my warm house. Those shots of the eye brow ice crystals are amazing. Thanks for the great content on your blog. Fonk...I agree with you. CRAZY!!!!! Jill ~ I meant to say "CRAZY, but AMAZING!" Congrats to both you and Beat. Now I'm wondering if you'll ever do another winter race on bike? This is such a great write up. I do envy that you had a buddy but I don't doubt for a second that you would have no trouble alone either. You are a tough cookie. Wow. I agree with those that call you crazy. As I read your this post. my breath got short and I actually got a little anxious myself, even though I'm sitting in my office in Florida. Definitely a good bike year, I kept looking for you guys on the return (and on the out too) but it was dark on the river and couldn't tell one person from the next. Congrats on finishing. I love this! I can't wait to hear more! What an incredible write, you are! Good to have Jill in Alaska back. Wow, I've almost lost myself in hot conditions, but 40 below? You ARE one tough cookie! And a great writer too. I know how this ends, but dang it, I wanna know how it ends...love reading your stories Jill and really looking forward to chapter 2. For what it's worth, I think you're much stronger and braver than you make yourself out to be :-) To me, you're a rock star!